Education and the Pursuit of Wisdom examines the ways in which the timeless human search for wisdom relates to current educational practices. This book challenges the current approach of an economically-driven system preparing students solely for the workplace, and instead discusses the importance of teaching wisdom in order to enrich all aspects of the lives of students. Ozoliņš discusses how teaching young people how to make decisions will not only benefit them in everyday life, but will benefit society as a whole. Drawing on religious and classical texts such as Benedictine and Confucian works, Ozoliņš’ book assesses and re-evaluates the central aim of education, and moves toward developing a robust understanding of the value of wisdom and its implications. Alternative approaches to education and the ways in which educators can establish agency in this process are also carefully considered. 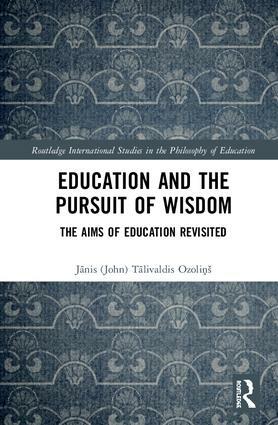 Detailed, well-researched, and with an international scope, Education and the Pursuit of Wisdom is an ideal reference work for researchers, lecturers and postgraduate students of education, and in particular the philosophy of education and the concept of wisdom. Janis (John) Talivaldis Ozolinš is Professor, College of Philosophy and Theology, University of Notre Dame Australia, former Professor of Philosophy at Australian Catholic University, Australia, and permanent Honorary Fellow of the Institute of Philosophy and Sociology, University of Latvia. He is Reviews Editor for Educational Philosophy and Theory.